Two Daily Live Theatre Performances Come to Ubud, Bali at Royal Palace and Desa Visesa. Through the generous support of the Visesa Desa Ubud Bali two exciting new daily theatrical performance celebrating the Indonesian lively arts will commence on January 31, 2018. 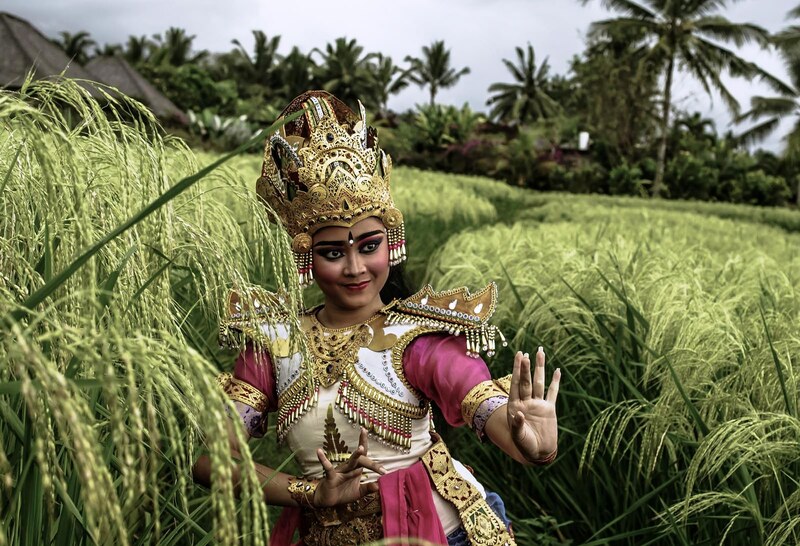 The two performances – operating under the umbrella titles of “Balinese Living Arts” have been months in preparation by two world-renowned artists. Made Sidia from the fabled Sanggar Paripurna – is a true renaissance man of Balinese artistry considered a master of carving, theatre, gamelan, dance, painting, and puppetry. Australian Peter Wilson who directed the extravaganza “Nature” that opened the 2000 Sydney Olympics and created mesmerizing puppetry elements for the 2006 Commonwealth Games and 2006 Asian Games – is again combining artistic energies with Made Sidia with whom he designed and inspired Bali’s longest playing musical extravaganza at the Bali Agung theatre. The production opens in a Balinese traditional banjar as, one-by-one, talented artisans appear performing their respective crafts of creating traditional flutes, carving masks, fashioning beautiful traditional offerings, painting on canvas, and creating traditional puppets. Dancers executing key segments from the rich Balinese dance repertoire as they enter the village center. Shiva – manifested as Nataraja – make a triumphal entrance performing the Ananda Tandava Dance of supreme bliss underlining the supremacy of dance and the almost endless other art forms practiced in Bali as the craftsmen and artists return to the stage for the program's conclusion. Both shows represent an unparalleled opportunity to gain a deeper understanding of Balinese art and culture, the rich history of Ubud’s Royal Household, and the pervasiveness of agriculture in the Island’s daily life. And, as with all their past collaborations, Sidia and Wilson will introduce into each program's cast of characters unique animal puppetry fogures that will both charm and mesmerize their audiences. The family palace of Ubud’s current Raja, the Palace is situated near the a fork in the Wos River - revered since the 8th century as a magically imbued place at which to pray, mediate, bathe and gather holy waters needed to perform local rituals.